The DJI Phantom 3 Pro provides buyers with the unique opportunity to get high-end technology at a fairly moderate price. This drone has received a sequel since it first debuted, but still stands tall against many of the other products that currently occupy the market. The relatively reduced price tag may mean that the Phantom 3 Pro will appeal to buyers with a variety of needs. Photography enthusiasts looking for a reliable eye in the sky are going to love the hardware that they get here. Meanwhile, gadget lovers are also given an interesting opportunity to indulge their passion for a competitive price. Your money does buy you quite a bit here. A 4K capable camera, an intelligent design, and sensors that protect even novices from expensive or even dangerous piloting mistakes are all features that account for a drone that is worth getting to know. 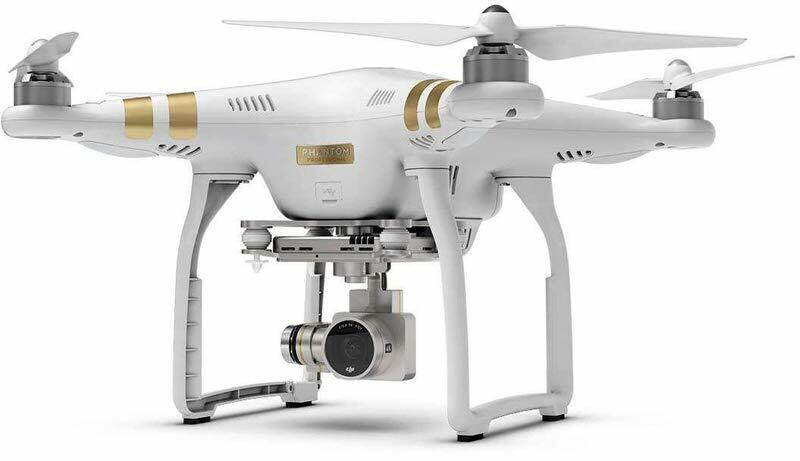 The DJI Phantom 3 Pro features a design interface that is typical of most drones. The body of the product is sleek, featuring dimensions of 18 x 13 x 8 in. The quadcopter features four rotors that extend from the body of the product via short arms. The camera is then mounted beneath the drone with legs extending out below to ensure that the camera does not come into contact with turf upon landing. Sensors are spread out around the Phantom 3 Pro to ensure safe flying without the risk of collision. The design ultimately thrives on simplicity—an effort that seems to have been extended to the controller as well. The remote features a very straightforward design, with joysticks for navigating the drone, and a mount for your phone so that you can see through its eyes. We will now take a look at some key features that might factor that will help determine if the DJI Phantom 3 Pro is right for you. The battery life of the DJI Phantom 3 keeps in line with what one would expect to see from a drone of this caliber. The manufacturer estimates for 23 minutes of flight time with this unit. Of course, manufacturer estimations don’t usually account for inclement conditions. For example, if you fly the drone in high winds, you might experience a much shorter flight time. Still, the fact remains that twenty-three minutes is above average. The very best drones that you can get at the consumer level generally feature a flight time estimate that can range between 20-35 minutes. Of course, more is always preferred to less, but regardless the flight expectancy that is featured here leaves very little to complain about. DJI demonstrates a commitment to servicing users of every experience level with this drone. The setup itself is certainly quite indicative of this. The Phantom 3 Pro comes out of the box nearly ready to go. Users need only to charge the battery and the controller. You then install the app, go through a quick setup process, and you are good to go. Setup is rarely a make or break consideration, but it’s also always nice when a product makes it easy to get started. The app even features a training program that will allow you to try piloting a virtual drone without risk. It’s essentially a flight simulation that will help you get the mechanics of flying without running the risk of banging up your new purchase. The performance of the Phantom 3 Pro is unambiguously very good. Users of every skill level will appreciate the easy to use interface of the controls, and the very straightforward flying experience that they yield. Much of the simplicity and ease of use is thanks to the high-quality sensors that do an excellent job of keeping the drone completely stable as you use it. The easy handling makes this product as friendly for the beginner as it is for the pilot that has a little bit more experience under the belt. If there is one complaint, it is in regards to the Android app. While the IOS experience is pretty seamless, the Android app can be prone to stalling a little bit, which does stall the smoothness of the flight ever so slightly. DJI is keeping things hip by enabling a unique live stream feature to the Phantom 3 Pro. This feature is essentially exactly what you would expect it to be. Through the app, you can opt to stream the footage of whatever video the drone is taking to your YouTube account. The streaming capability gives your audience a live, unfiltered look at your flying experience. Streaming is optional and needs to be deliberately activated before any footage will be publicly shared. Of course, a high-performance drone is only as good as its camera. In the case of Phantom 3 Pro, you get a really good one. In fact, this is the primary difference between the Pro and other options in the Phantom 3 line. The Pro upgrades the 1080p capable camera with one that can shoot 4K. There is a range of operating speeds, between 24-60 frames per second, giving users a range of control that guarantees they come prepared to just about any situation. For your reference, we have included a comparison chart between the Phantom 3 Pro, and one of its rivals, the Parrot Bebop 2 FPV. For what it does, the Phantom 3 Pro will earn a lot of favor just by virtue of its price tag alone. Though not cheap in a general sense, this unit does perform at a level that is similar or equal to many products with much heftier price tags. The tech is slightly dated. Newer drones of this caliber feature even better sensor technology, as well as other small but impactful upgrades that this product lacks, like longer battery life. But that doesn’t change the fact that this product does a lot of things the right way. Great handling, an excellent camera, and comprehensive phone app are all features that most people will want to get their hands on.